ArticJonathan Saragossi is the founder of IM Creator, a free website builder, and AppSite, a tool for promoting mobile applications. Jonathan is also a UX and marketing consultant for major startups including Any.Do and Playscape. It’s time to move on. The feeling is becoming more and more significant with each passing day and it just keeps spreading. It’s just not it any more… we want something new, exciting, which can take us places we’ve never been. We want to be surprised again. We want a new, better social network. Facebook may say its user base is growing, but original members from the last decade appear to be leaving in droves. As more niche networking services and platforms enter the space, people are finding that not any one company is serving all of their networking needs. Our tastes and channels are becoming fragmented, and users are pushing back on accepted norms in the social media space. This is inevitable. It’s a natural life cycle for any product; unless it somehow becomes a living organism with its own reproductive system and evolution, one will eventually wither and die. Facebook cannot evade this process – it regenerates with nuances, but is not reinventing itself. This curve is missing something important – the two-way migration that happens over time. 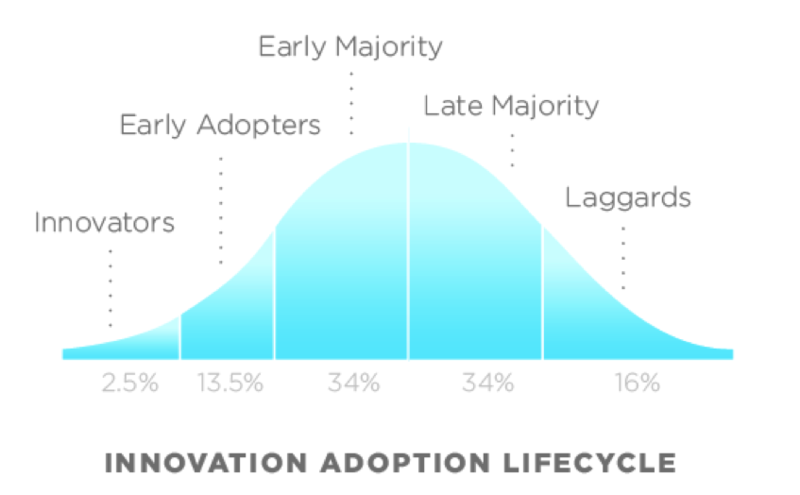 When the late majority joins in, the innovators and early adopters are already feeling uncomfortable. Facebook today doesn’t resemble a thriving, living metropolis – it’s more of a friendly neighborhood bar. For that reason, FB will face its cruel destiny of simply fading away. Living in the same city as your parents is forgiven and acceptable; there is enough diversity and distance between everyone. But finding yourself sitting in the same bar as your mom and dad – that’s horrifying. When your father posts pictures of sunsets and breakfast on his wall you know it’s over. I’m a business man and a family man. I love collecting chairs and getting drunk on the weekends. I want to introduce all of these aspects to my network. I’m not the boring and stiff ‘LinkedIn Jonathan,’ nor am I the friendly smiley social creature presented on Facebook, or the Tumblr pervert, or the obsessive Pinterest collector for that matter. I am all of these things wrapped in one. This combined display has a real advantage, even for any one of the separate verticals: It would be easier for me to go into business with someone when I can see their family and hobbies. I’ll feel closer knowing we have some common ground. It will also make dating, keeping in touch with family, and finding new friends easier. Combining your identities, creates a synergy and depth to your online persona. Privacy issues? Not really. If you’ve done it in public – it’s public. Thinking it will remain a secret is naïve. You want a completely alternative identity? Open a second profile. Unlike Facebook, it’s not forbidden, but recommended in the new social network of the future. This social network is sure to start as an app, and its core audience will be on mobile. 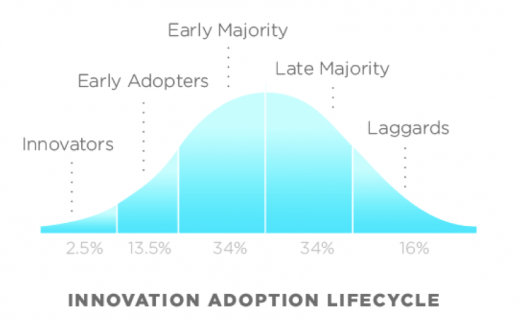 The market penetration potential is huge and can be attained faster than any other technology in history. The representation of this social network on desktop computers will be marginal, and only as a convenience for those who feel uncomfortable without it. Facebook lets me down every time I crave something new. It always offers me to return to my families’ and close friends’ warm embrace. I want to break these confines. Its shortcomings are fully revealed when arriving to a new location where you have no acquaintances. Suddenly, Facebook is silent, keeping you informed on irrelevant pictures from home, making you feel guilty and homesick like your meddling aunt. It happens to me every time I arrive in Tokyo – I get left out. Facebook knows what’s happening right around me, but it won’t tell me. The next social network should let you break through your closed social cliques and instead try to diversify and expand them. You’ve landed in a strange city? This is the action happening around you right now. Everybody – all foreign and wonderful – is going to a concert tomorrow. You might like this because you’ve indicated a love of music. In the concert itself – it’s the girl dancing next to you. Maybe send her an animated GIF to break the ice? Humans as curious animals are naturally interested in the unknown. The new social network should help us expand our horizons; it will be much more adventurous than the warm cozy environment Facebook has to offer. The profile, content, visitor stream are all mine. Our friends aren’t meant to be crammed into a rented room in a huge blue-gray hotel. We should own our apartment, with the ability to decorate, organize, and expand as we please. I don’t want to be facebook.com/Jonathan. This immediate association to a specific network limits me and portrays me as a specific character that I’m not interested in being. The next social network should be decentralized and each person will be the owner of his or her own content. It will create independence and a much stronger emotional connection. This ownership lets us invest more time, energy and money because we will know it’s so specific to just us. Tumblr does this well. It’s easy to take a profile or blog, connect it to a domain, make it independent and still enjoy the network’s social tools that provide the option to discuss content and speedy, unmediated distribution. Ownership over content will open new economic possibilities. Once the real estate is yours, the profits originating from it are naturally yours as well. The situation today is quite different. Posting a very popular status on Facebook, with hundreds of likes, comments and followers will not provide any profit to the writer of the post. Your friends, who came because of your content, are clicking on commercials and the entire profit goes back to Facebook. It’s unfair considering you’re the one that drew the crowd. What you get instead is akin to a useless “reward” in the form of likes, while Facebook counts its profits. We sell our content for peanuts and I believe, like many, that is about to come to an end. The new social network should share profits with users who create the content. In fact, it shall only take a small commission, and offer the option to convert the commission to a fixed monthly sum in exchange for the technology services it provides. Taking it further, the new social network should provide simple solutions for product sales, real or virtual. Like a full, closed marketing circuit, it will take us from reference to purchase and will serve huge, all inclusive mega stores just as it serves personal micro stores. We invest so much time in our current social networks propagating word of mouth brand value and referrals , there’s no reason why the next social network can’t include this process and allow users to turn their invested time into an alternative income source. The business models it will use will be more sophisticated and will include an affiliation model. If your like eventually lead to a purchase, you should get your share of the earnings (10 percent for a referred paying customer is a reasonable, although low, commission in the affiliation industry these days). If your recommendation results in the purchase of a Toyota there is a lot of money to be earned. Mark Zuckerberg is known for the hacking culture he confers on his employees – rebelling against authority, building new things, and finding tricks or bypasses. The problem with Facebook is that this culture remains only inside the company and development teams. The users themselves, meaning all of us, are given no room for “hacks.” If you have a Facebook profile and you revolt or upload unusual content, there’s a chance your account will get deleted. The ability to change and develop your Facebook profile, in ways that are yet to be developed, does not exist. A natural evolution and development cannot exist with such narrow options. There is no room for new iterations and being cutting-edge. It does not allow for the necessary diversity needed to create a true city. This is the problem with Facebook. No doubt my vision is ambitious, but it’s not far-fetched. There can, and will, be a social platform that embodies the attributes outlined here and we’ll all wonder why it didn’t come sooner. We’re already seeing mobile-first, hacker-friendly, ownership-oriented platforms emerge and succeeding. The next social network will provide tools with which it will be possible to create endless variations – variations the original creators of the network could have never dreamt of. That’s where the magic is going to happen; where the masses will create perpetual diversity and disruption, effectively avoiding Facebook’s fate. After all, how can you disrupt a network that is disrupting itself? What does your dream social network look like?